Review: Dream Wife, 'Dream Wife' On its debut album, the London-based punk band combines sticky pop flourishes and bruising sounds with brazen self-assurance. The London-based punk band combines pop flourishes and bruising sounds with brazen self-assurance. 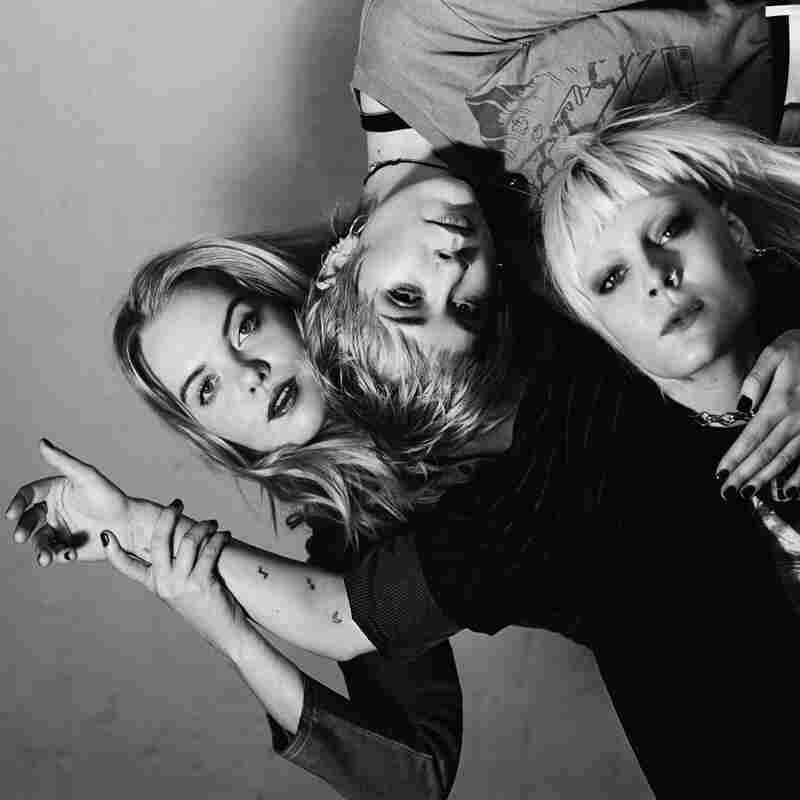 The London-based punk band Dream Wife began as an elaborate lark. In 2014, a trio of Brighton University students formed the troupe as an art school performance project that was "meditating on dreaming big and being a woman," Somerset, U.K.-raised bassist Bella Podpadec once explained. The fictitious group wrote original songs, filmed a This Is Spinal Tap-esque documentary explaining their vivid backstory — in short, they were a girl band that worshiped the '90s and wanted to go to Canada — and even performed at a gallery opening. Soon enough, Dream Wife's imaginary ambitions came true: an Iceland Airwaves appearance and even a Canadian tour followed by the end of the year — as did the sense that the band had a viable real-life future. Dream Wife's eponymous debut reflects similar attention to detail. The musicians — Podpadec, guitarist Alice Go and the Iceland-born vocalist Rakel Mjöll — combine sticky pop flourishes and bruising sounds with brazen self-assurance. Handclaps and bratty backing chants cut through the grimy riffs and disillusioned sentiments of standout "Hey Heartbreaker," while the needling "Kids" is a hybrid of Life Without Buildings' jittery post-punk and Bangles-caliber cascading harmonies. Other reference points crop up throughout Dream Wife — noisy indie rock, riot grrrl's sharp-edged punk, and the confrontational concision favored by '90s U.K. icons Elastica and Kenickie — but the music avoids being any sort of direct homage to any particular era or movement. In this way, the record is as slippery and chameleonic as the output of two of the band's biggest inspirations, David Bowie and Madonna. But Dream Wife is very much about the experience of pushing back against patriarchal conventions and the burden of gendered expectations. The scorching opener "Let's Make Out" is gleeful and self-explanatory. As guitarist Go's lurching punk riffs rage, Mjöll expresses impatience that boils over: She howls the song's titular declaration, offers a couple of potential ideas for sneaky smooching and alternates asking, "Are we too shy?" with "Are you too shy?" The turn of phrase is subtle and transformative: One question implicates herself in any hesitation, and the other acts as a flirtatious taunt. The idea that desire is a messy proposition also crops up on "Spend the Night." Mjöll dramatically trills, "I would like to know you better," as the time remaining for a sleepover ticks away, but asks for clarity in return: "I can't read your mind." On the Sugarcubes-reminiscent "Love Without Reason," Mjöll tries not to question her feelings, but simply implores — with soaring gusto and more than a dash of optimism — "Let's be kids and fall in love." There's an unapologetic tone to these songs that's appealing. Not every situation described is resolved easily, or even in the way they'd like, but the band members aren't afraid to ask for exactly what they want. Many of Dream Wife's songs leverage deft linguistic tricks to amplify this commanding emotional stance. The thrashing "Act My Age" uses playful rhyming wordplay to underscore its ask ("Do I amuse you? Do I confuse you?") while the corrosive grunge-punk closer "F.U.U." employs vitriolic assonance, notably on the lines, "I'm going to f*** you up, going to cut you up, gonna f*** you up." For added tension, Mjöll manipulates the pace and approach of her vocal delivery. Sometimes it's rapid-fire, while at other times she draws out words for maximum impact. And on the roiling "Right Now," her gulping, speak-sing approach crescendos into distortion-smudged shrieks. On the fuzz-coated '70s rocker "Somebody," a bold declaration of bodily autonomy, Mjöll firmly repeats the mantra, "I am not my body / I am somebody," in the guise of a protagonist warding off objectification. It's one of the most powerful moments on the record and, not coincidentally, one instance where Mjöll's crisp enunciation is impossible to misconstrue. Dream Wife is extending the continuum of uncompromising feminist musical statements with refreshing directness.